Preheat oven to 400. Pierce each sweet potato several times with a fork. Rub each one with one tablespoon of olive oil, then add desired amount of salt. Roast potatoes until fork tender, about 45-60 minutes, depending on thickness. Slice potatoes lengthwise down the center (careful not to cut all the way through). 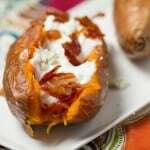 Top each sweet potato with 1 heaping tablespoon Greek yogurt, 1 tablespoon goat cheese, and one slice cooked bacon. Add a pinch of black pepper if desired. Serve immediately.